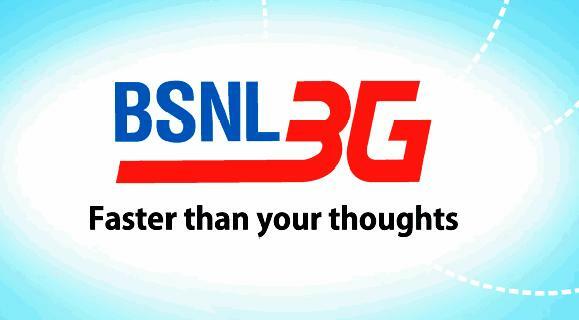 BSNL 2G Data Plans and 3G Data Plans Revised effective from 15th April 2013.Due to Increasing Internet Usage and Demands by the Smartphones Users Some Major Telecom Companies like Vodafone,Airtel,Idea,MTNL have already increased their Internet Data Plans for both Preapid as well as Postpaid Users and Now its time for BSNL one of the Leading India’s Telecom Company.BSNL (Bharat Sanchar Nigam Limited) has Recently Increased their Internet Data Plans Both 2G and 3G Data Plans for Prepaid as well as Postpaid Users.How to Download Torrent Files Using IDM : Faster and High Speed Its been a Shocking news for the Users using the Unlimited 2G Internet Data Plan for Just Rs 274 since it has been revised too.BSNL has either Increased Costs of Some Data Plans or has Reduced their Validity Period or has limited their Data Usage.The Reason of Increasing Costs of these Internet Data Plans is due to bad Government Policies and Due to Telecom companies.BSNL Offers lots of 2G Data Plans for the Prepaid Users of which most Popular plans are Rs 54 , Rs 125 , Rs 270 and Rs 300 Designed according to the Users Needs i.e Light Users ,Medium Users and Heavy Users.How to Download Play Store Apps on PC But Now due to Increased Prices you will not be able to Avail all the features that your were Previously getting on these Data Plans because of either due to Reduced Validity Period or Limited Data Usage.Here below is a Full Revised Tariff Plan for BSNL 2G Data Plans and 3G Data Plans with effect from 15th April 2013. Rs 54 Plan now offers the Same Data Usage 500MB But with Reduced Validity Period of 25 days only. 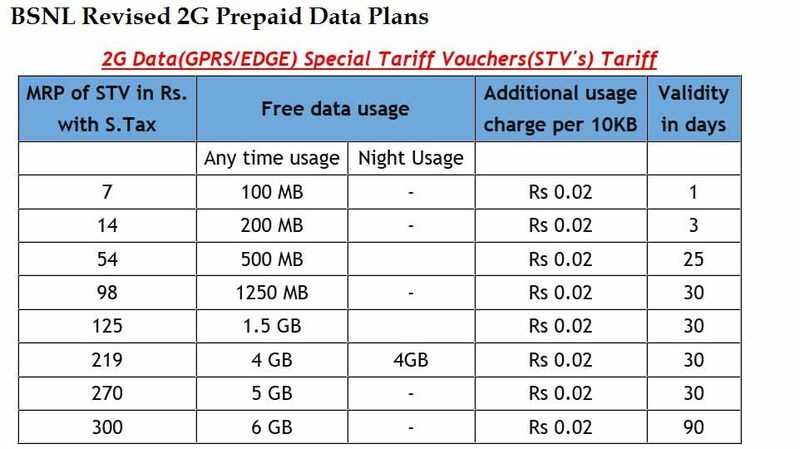 Rs 125 Plan now offers only 1.5GB Data Usage Instead of 2GB Data Usage with the Same validity of 30 days. Rs 300 GPRS Plan has dropped its 8GB Data usage to 6GB Only with the Same validity of 90 days. 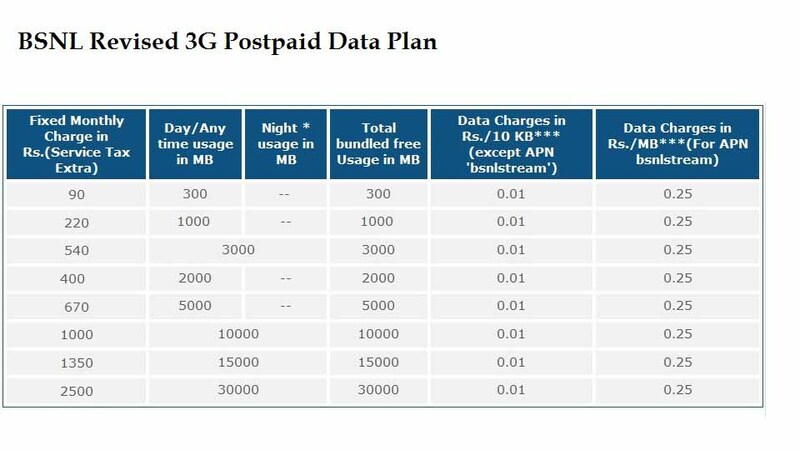 Here below is a Full list of all the 2G Prepaid Plans that have been Revised Effective From 15 April 2013 available in all the BSNL Circles. Fixed Monthly Charge (FMC) in Rs. 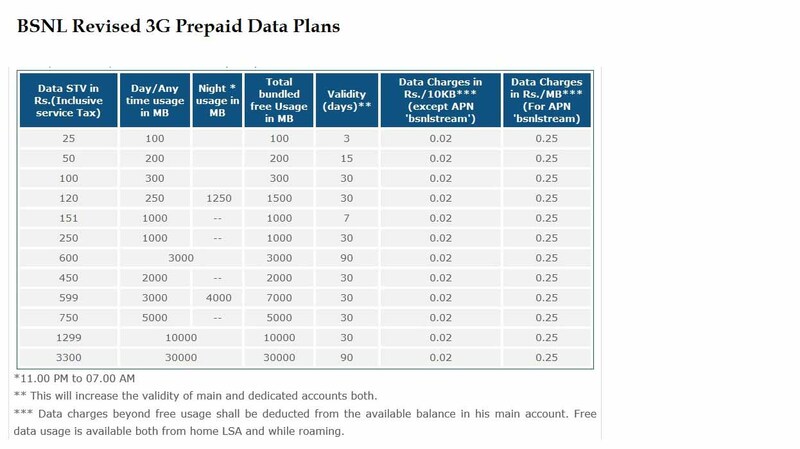 First of all to Use these Data Plans on your Phone You must have a Minimum of Rs50 Balance in your Preapid Account else your GPRS Services will be Suspended until your Account Reaches a Minimum of Rs50. Check Data Usage – You Can Easily Check your Prepaid Data Usage by Dialing *123*10#, *123*4# or *123*6# from your Phone. Note Important – You Must note that these Prices may vary depending on Your BSNL Circle by Rs 5 (+/-) so please ask your Recharge Operator before Recharging your Internet Data Plans or Alternatively you can ask from BSNL Directly by calling 1503 Customer Care Number. hi bro bsnl 2g plan is give us unlimited data if yes so how get these pack???? ?